Do I Need AMP Pages For My Site? If you work with websites you’ve likely heard of AMP, but you may not have implemented them. There has been a lot of back and forth on whether or not AMPs are right for your site. For some it is best practice, for others, it may be a hindrance more than a help. This article will help you identify whether they are right for your site. AMP stands for Accelerated Mobile Pages. It is based off of AMP HTML and is designed to improve page load speed by 15-85% on mobile. It was created with a special focus on sites that use rich content, which loads slower on mobile in other formats. Sounds Good, So I Should Make The Switch? 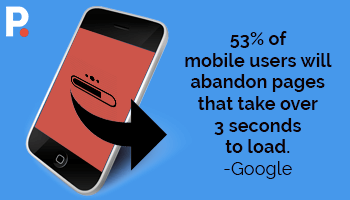 Increasing page speeds directly impacts your SERP position, especially on mobile. Google has been putting a lot of focus on a mobile first mentality. Mobile optimization is factored into desktop rankings as well. So it seems like Using AMP would be a no-brainer. The pros & cons will weigh differently depending on your team’s size, time constraints, and site goals. There is no one-size-fits-all answer for whether or not to use AMP. A look into what business types do or do not use AMP can help you decide your best content marketing strategy. For many sites, simply using responsive design is enough to satisfy their mobile optimization needs. For others, AMP pages can make a big difference. You need to understand how your consumers are using their smartphones to make the right choice. Where are you trying to reach your user base? If your intended audience is mostly found on desktop, AMP pages are not necessary. This is the most cut and dry example of whether your site needs AMP. News sites typically rely heavily on mobile usage. Slow load speeds make visitors unlikely to browse more content. News, and other sites that rely on content consumption to drive revenue, frequently use AMP pages. If your goal is to have mobile users view more pages, AMP is a powerful tool. If your site relies on ad revenue make sure that your ads come through one of the AMP supported ad networks. Enabling AMP for ecommerce websites is a trade-off. On the one hand, Analytics data & metrics are more limited. This goes against typical ecommerce best practices. On the other hand, AMP theoretically offers better customer retention. A decision here means measuring one against the other. Even the e-commerce giants are not united in whether or not AMP is best. Currently, Ebay appears to be using AMP, while Amazon does not. Using accelerated mobile pages can be a valuable tool, but it’s not right for everyone. Deciding on the most effective search optimization strategies means finding the strategy that aligns with your business. Do you need digital marketing that is tailored to your specific business & goals? Contact Pedestal today for a free marketing assessment!